Online Moisture Absorbers with outstanding performance. 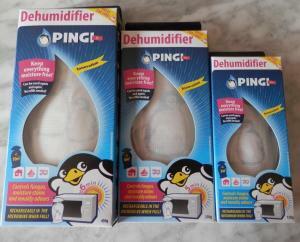 Online Moisture Absorbers / Dehumidifiers with outstanding performance. Shopping online can be a bit daunting. There are so many different sites. Which is the best? Apart from the wide choice, there are instances where customers have been misled or defrauded in transactions on the internet. With our Online Moisture Absorbers transactions, we have taken some steps to try and reassure potential customers that they will get what they pay for. We give you as much technical information as we can about our products and the various applications. An operational maintenance page (designed for Australian consumption) is included with our products. Our PINGI Online Moisture Absorbers comply with EU product safety standards. We only accept Paypal (with E-commerce transactions) despite incurring extra costs. We feel this is the best and safest online consumer payment system. You can of course also pay with a credit card on the phone for more specialised orders. Our Online Moisture Absorbers are stored locally (Central Coast). This ensures a fast response and in most instances our products will reach you within a couple of days. The ACCC has some good advice about the pitfalls of online shopping. Click on the red link for more information. What makes our Online Moisture Absorbers so special? Our products are very easy to use. No refilling or leaks are possible and you can place the moisture absorbers in sports bags, cupboards, cars, boats, caravans, bedrooms, bathrooms or any other enclosed space. Quick recharge in a microwave oven means you can use the moisture absorbers many times. Visit our Why Pingi page for more details. Want the best moisture absorbers available? last night we recharged our Pingi (for thr second time) as per the instructions. Our microwave is a 600w as specified as optimum for recharging. Following lifting tge Pingi off the microwave safe plate a hole had melted in the bottom of the Pingi allowing the contents to spill out. I have pictures to send to show the fault but I am unable to attach to this comment. Please advise in relation to the above. We went through our records and could not find any record of a sale to you. Can you confirm that we supplied the product? Suppliers in the UK and NZ also sell the product in Australia. The blue indicator can become damaged if it comes into direct contact with water. The product itself will still work. Pingis absorb around 40% of its weight before becoming saturated. You should be able to weigh the product to determine saturation. Another option is to get a new product from your Uk suppliers. We only sell Pingis in Australia.